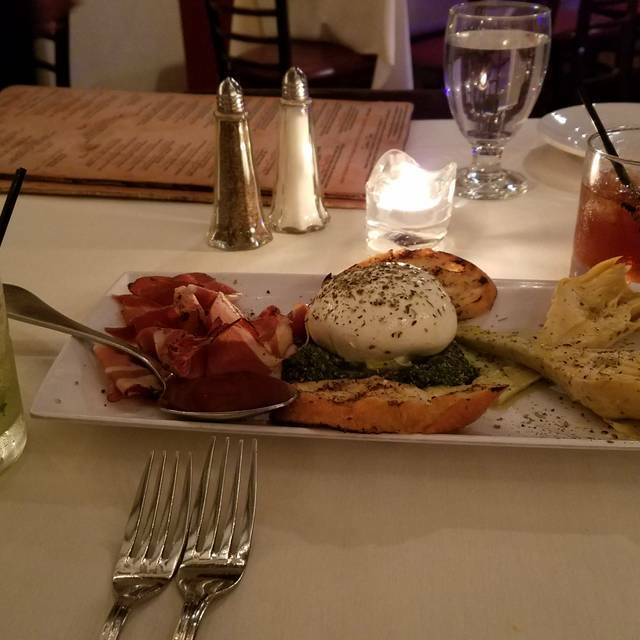 All of Giovanni's dishes are made to order satisfying every customer’s needs. Accommodating dietary restrictions and allergies when needed, but always providing fresh delectable dishes for every palate. Additional $10 charge for plate sharing. Diced tomatoes, fresh garlic, onions, basil, served on grilled bread slices. Creamy corn meal finished with diced sausage and peas in white wine garlic and oil sauce. Sausage and peppers sauteed in white wine garlic and virgin olive oil. 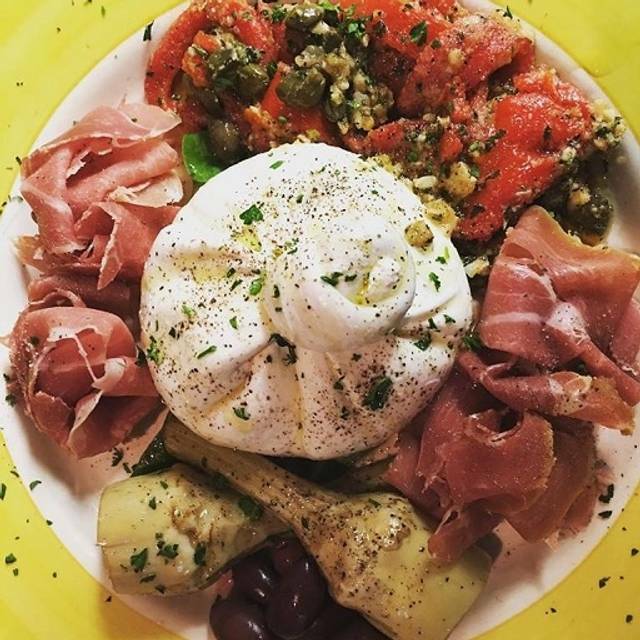 A Combination of cured Italian cold cuts, cheeses, olives, artichoke hearts, roasted peppers. Goat cheese baked in marinara sauce served with toasted bread seasoned with garlic and paprika. Baked clams (A Mio Mode). Six per order. East Coast black mussels simmered in marinara or sauteed in white wine, garlic, scallions and virgin olive oil. Nonna Nicoletta's old recipe of hand diced mix vegetable with white and red beans. Add Chicken $4, Sausage $5, Shrimp $10, Scallops $20. Hearts of romaine, tomatoes, red onions and carrots. Served with your choice of dressing. Grape tomatoes, red onions, garlic and cucumbers drizzled with virgin olive oil and oregano. Hearts of romaine tossed in our home made dressing with croutons and romano cheese. Tomatoes slices, fresh mozzarella, basil roasted peppers olives, drizzled with balsamic glaze and virgin olive oil. Imported Italian Arborio rice with mushrooms. Imported Italian Arborio rice with shrimp, black mussels, baby Manilla clams and calamari. In red (marinara) or white (garlic, oil, white wine) sauce. Imported Italian Arborio rice with 4 Cheeses. White wine, onions, cherry tomatoes and pancetta. Garlic and oil with roasted peppers, escarole and mushrooms. Homemade pasta tossed in a ground meat sauce. Potatoes dumplings in spicy marinara sauce with pancetta. Tossed with fresh ricotta cheese and marinara topped with mozzarella and baked. Bowtie shaped pasta in garlic and oil with broccoli. Homemade pasta tossed in classic cream and cheese sauce. Linguine and Shrimp "Fra Diavolo"
Shrimp, minced green, red peppers, olives, capers, anchovies in spicy white wine tomatoes sauce. Small cap-shaped homemade pasta in garlic and oil with shrimp, sun dried tomatoes and rapini. Cheese filled ravioli in marinara sauce. Homemade wide fettuccine egg pasta in a creamy marinara sauce with vodka. Baby Manila clams in red (marinara) or white (garlic, oil, white wine) sauce. 8 Finger Cavatelli " Barese"
Homemade 8 fingers cavatelli in garlic and oil sauce with our homemade sausage and rapini. A light creamy tomatoes sausage with onions smoked pancetta finished with fresh mozzarella. Traditional southern Italian dish consisting of black mussels, clams, calamari and shrimp slowly braised in marinara sauce served with linguine. Chicken breasts pounded thin, breaded, pan fried and baked in marinara sauce layered with mozzarella cheese served with a side of pasta. Chicken breasts sauteed in lemon butter sauce, with oregano and paprika served with potatoes. Chicken breast sauteed in lemon butter sauce layered with spinach and mozzarella cheese. Veal cutlets sauteed in Marsala wine with mushrooms served with a side of pasta. Veal cutlets sauteed in a lemon butter sauce with artichokes hearts, mushrooms and capers, served over angel hair pasta. Veal cutlets sauteed in light white wine sauce with a touch of marinara layered with sage, prosciutto, mozzarella cheese served over angel hair pasta. Tilapia filet in a light tomatoes cream sauce with artichokes hearts, roasted red pepper, asparagus served over imported Italian Arborio rice risotto. Chilean sea bass filer, sauteed in a light lemon butter sauce with capers and sun-dries tomatoes served with grilled asparagus and our soon to be famous roasted garlic and onions mashed potatoes. Wild caught Atlantic salmon fillet in classic white wine, olive oil & garlic sauce with jalapenos. Homemade pork and lamb sausage in a white wine, onion, garlic and marinara sauce with red and green peppers, mushrooms and potatoes. Bone in pork chop baked in classic Vesuvio sauce with peas and potatoes. Skirt steak, marinated in garlic, lemon, olive oil and oregano. Grilled to taste and served with an arugula salad and parmesan crusted potatoes. Bone in prime cut Rib Eye steak seasoned with salt, pepper and a touch of garlic, Grilled to perfection and served with roasted potatoes and steamed broccoli. Attentive and considerate staff, delectable food, prompt service. An appetizer of ricotta-stuffed eggplant topped with marinara sauce was delicious. and an entrée of shrimp and crab-stuffed ravioli and black mussels in a pesto sauce was outstanding. The restaurant, a small space, was full, and so the noise level was elevated to the point that conversation with tablemates was not as easy as we would have preferred. But the food and service were sublime. Great time. Not rushed. Got to relax and enjoy company and dinner. Warm ambiance, fun energy, though did get slightly loud. Francisco and his dad are the best hosts. Everyone loved every item ordered. Best part is they are so accommodating to requests, food changes, allergies, etc. 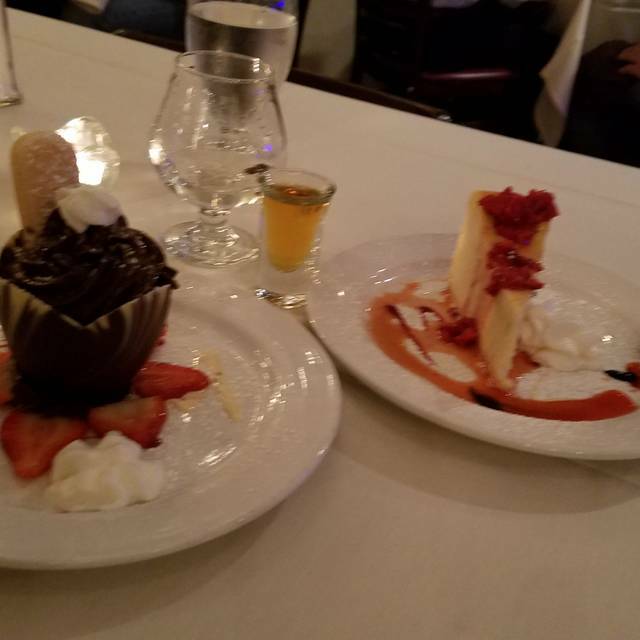 Even enjoyed their house made Limoncello with dessert. Yum! Yum! Yum! Great food and great service!!!!!!!!!!!!!!!!!!!!!!!!!!!!!!!!!!!!! Great food, wonderful service! Very authentic Italian cuisine. Fantastic homemade dessert! Best Italian restaurant I have ever eaten at! My wife and I went there due to a recommendation of a colleague of mine. The food and service not only met but exceeded our already high expectations based on what we heard. A gem of a family restaurant with exquisite tastes from appetizer to entree. Our only minor hang up was that the service was so attentive that our to go dessert and check was being held up while our server chatted it up with other guests at another table. The food is made to order and so delicious. The portions are rather small for an Italian restaurant. The restaurant is very, very small. The owner comes on a bit too strong as he was the waiter for us. I would definitely return. We arrived at 8:30pm and it was so loud we almost walked out. I have to say I’m glad we stayed. The noise level dropped after about 20 mins. The service and food were both amazing. We had grilled calamari, salmon and tilapia. Delicious! Always an enjoyable and tasty experience. Giovanni and Francesco always make you feel at home. Bravo! I went my first time here for a date. Food, delicious. Service, amazing! She knew how to make to you feel comfortable. The only downside is I could barely hear my date because The restaurant is small but yet they tried to fit as many tables as possible. The best true Italian restaurant!!! Not the same over saucy stuff. Do any special they offer. Mahi was awesome!!! Just a wonderful experience all around! Beautiful, cozy space, excellent food and service. We will be back. Great but on a Saturday night be prepared for a very noisy space! Everything was excellent again! Risotto perfect and skirt steak tender flavorful! This was our first time at La Notte and we look forward to returning soon. Excellent service, a real family place. Dad is the chef and his son is in front. Menu is impressive. Preparation and presentations are excellent. We're delighted to have discovered La Notte and wish them all the best. Phenomenal food, wine and service. The pasta was made fresh and the sauce was top notch. It's one of those places where the chef is so good that you can't order the wrong thing, but I recommend the goat cheese as an app and any pasta as an entrée. The staff knew their wine well and did a perfect job pairing a wine with our meal. I will highly recommend this eatery to my network. If this place doesn't get a James Beard Foundation Award then there is no justice in this world! The food is so fresh, clean and oh my delicious! This is not a rush in and out place this is where you come to dine have a conversation and reconnect with people! Your meal is cooked to order, nothing is premade so if you have special needs they will accommodate you. Best Calamari I have had in years! Perfectly prepared melt in your mouth good! I was the only one to order off the menu (Pollo alla Parmigiana) so good! The rest of my group got the daily specials everyone raved about their meals! I Highly recommend this lovely place! Food was excellent, however the restaurant is relatively small and space is limited. Had to wait 20 mins for a table even though we had reservations. The ambiance is romantic, but can get quite noisy. Excellent food. Good friendly service on a very busy Valentine's evening. My first time there and I will be back for sure. Service and food was very good. The noise level can be a problem. We went early but by the time we left you could not carry on much of a conversation. Excellent service, and food that was both fresh, hot and tasty! If you like genuine Italian food, this would be a great choice. Located in downtown Oak Park it is a gem. Great food and service and an owner who personally greets you and makes sure everything is to your liking. Highly recommended. Amazing Home-Made Food, Cozy Atmosphere, Amazing Hospitality From Father, Son owned Family Bistro...Giovanni & Francesco Definitely made My Mother-in Law's 89th Bday ,Special!! 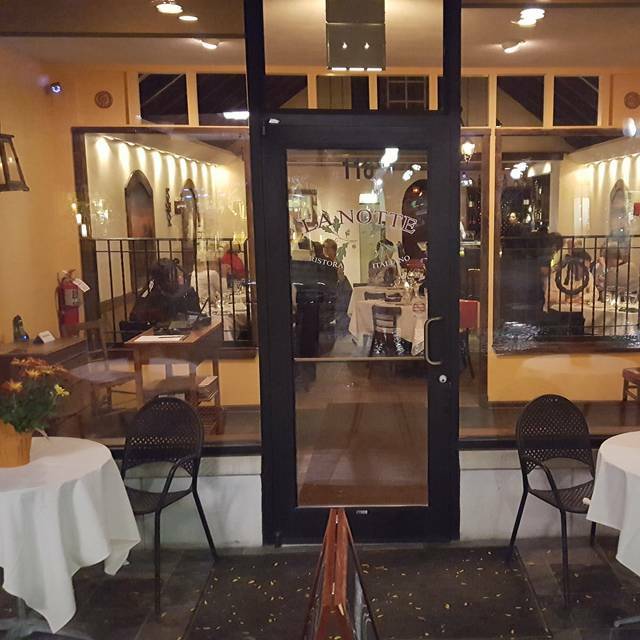 A Must Try Hidden Gem in Downtown Oak Park! We were celebrating a friend’s birthday. The food and the service were both outstanding, and the chef’s tableside preparation of the sea bass added an element of ceremony to the occasion. The only disappointment was the noise level in the restaurant, which interfered with easy communication. Wonderful as usual. The service surpassed only by the food quality of preparation!! We celebrated my husbands birthday here. Had never been here before. It’s quite a smalll space, but charming. Our party size ended up increasing to 5 and the restaurant was very accommodating. A couple of us were late and they were very patient with us. The waiter had good recommendations. The good was fabulous. I had the sea Bass. Portion size is perfect. Another person in our party had the seafood stew, chicken vesuvio, and ravioli. All prepared well. They brought us bread and it was very fresh. Too full for dessert. Charming place in the heart of Oak park. We will be back. The food is absolutely delicious, the service friendly and impeccable. The setting is so very comfortable and inviting. Food was delicious and the portions was generous. Great cocktails. Service was great. We enjoyed our New Year Eve dinner tremendously! Owner and staff very courteous and attentive. Had the Sausage and Peppers, Pork Chop stuffed with four cheeses and served with mashed potatoes, Skirt Steak served with Arugula and Parmesan crusted potatoes, and homemade Strawberry Gelato. Food was delicious and the presentation was awesome. This cozy restaurant has some of the best service of any restaurant in Oak Park, or for that matter Chicago. Hand made pastas and fish are always excellent. The wine list is well chosen and reasonable. Love this place. Honestly, the food is superb! 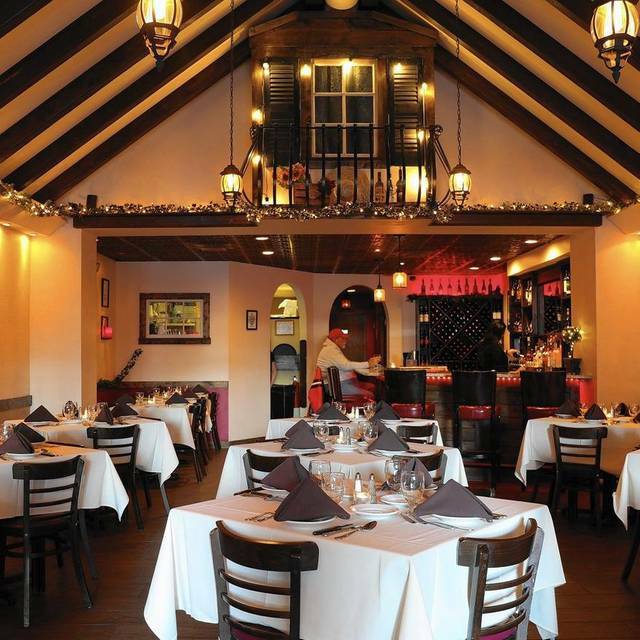 It is great place to go if you want good, authentic, Italian cuisine. The staff and owner are always super friendly and welcoming. I cannot say enough great things about the place. Not our first visit and certainly not our last. Has become a family favorite for my wife and me. Personal attention from the chef is always a plus in any restaurant. Cannot comment on brunch or other experiences because we have not (as yet) encountered them. Overall a true jewel in the Oak Park dining environment. I travel for work so I get to eat at some of the best places across the country. La Notte stands with the best of them. The one thing when eating authentic food of any kind its what you were brought up with well La Notte hits on two levels. His gravy/sauce is just like grandma used to make but Giovani puts his twist on dishes and they are outstanding. The Oysters, Clams, Pork Chop special just to name a few. Its a must try place.